Dr. Venkat Perumal joined the UVA Foot and Ankle Division as an Assistant Professor in the Department of Orthopaedic Surgery in 2013. Dr. Perumal completed his fellowship training in Orthopaedic Foot and Ankle Surgery at the University of Virginia. His practice focuses on foot and ankle reconstruction. His expertise includes sports medicine, foot and ankle trauma, total ankle joint replacement, Charcot foot deformities, foot arthritis and various tendon problems. 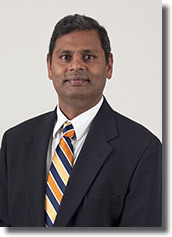 Dr. Perumal is a member of the American Orthopaedic Foot and Ankle Society (AOFAS). “I am married to Vanitha and we are blessed with 2 children. I like to play soccer, bike and play chess with my son. We also enjoy camping, hiking and travelling”. Total ankle replacement, fore foot and mid foot deformity correction, flat foot reconstruction, treating various tendon pathology and ankle instability.